Curious as to what colorful name the Aussies choose for the jet. "...The aircraft, A35-003, wears 3 Squadron markings which were applied in early November, the final stage in the production process ahead of several weeks of ground and flight testing. The jet is due to be delivered to Luke Air Force Base in early 2018 to be used for pilot and maintainer training, before being permanently relocated to Australia in 2020. 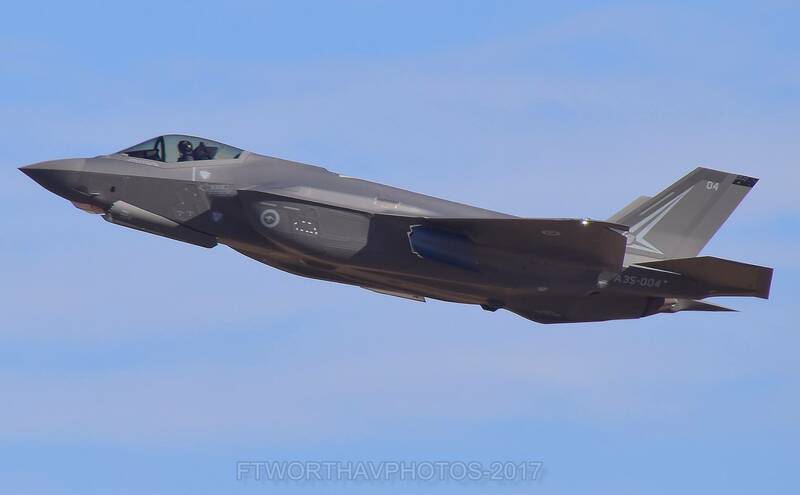 3 Squadron is due to become the first RAAF F-35 operational unit...."
"LUKE AIR FORCE BASE, Ariz. -- The Chief of the Defence Force took a trip down memory lane in September when he visited Royal Australian Air Force personnel training on the F-35A Lightning II aircraft at Luke Air Force Base in Arizona. Air Chief Marshal, ACM Mark Binskin, who flew [A4G Skyhawks in early 1980s initially in RAN FAA] F-16C aircraft at Luke AFB while on exchange with the U.S. Air Force in the 1980s, met with the team of maintainers and pilots working hard in the lead-up to the arrival of the first two aircraft in Australia in December 2018. ACM Binskin said training alongside U.S. personnel reinforced his belief that Australia and the U.S. had shared values and could “rely on each other as true friends”. “Training together over the decades has built close bonds, beyond just mutual understanding,” ACM Binskin said. “The benefits of our relationship were obvious during my three Middle East deployments and having flown alongside U.S. forces on operations. “Even today, 65 years after our friendship was formalised with an Alliance, our relationship continues to adapt to contemporary security challenges, like the cooperation between our respective nations as we work together to introduce the fifth-generation F-35 aircraft.”..."
"With Raytheon’s lock on the first increment of the US Navy’s Next Generation Jammer, a mid-band frequency jammer, Northrop Grumman is seeking the low- and high-band jamming pod awards. In June, Naval Air Systems Command (NAVAIR) released a notice asking industry how existing technologies meet requirements for a new low-band transmitter, which are generally used to jam early warning radars and voice communication frequencies. Increment 3 will address high-band jamming, as part of a comprehensive plan to replace the ALQ-99 pods on the US Navy and Royal Australian Air Force (RAAF)’s Boeing E/A-18G Growlers and give the fighters a full spectrum jamming capability. Last month, the government released a broad area announcement for industry to demonstrate existing low-band jamming technologies, Thompson says. The navy will decide this summer which companies will participate in the demonstration." Last edited by spazsinbad on 09 Dec 2017, 02:01, edited 1 time in total. The current shape of things with superhornet testing, The F-35 will be next. Returning to our original programming but LVC oriented BUT Australia no less OMG we are getting prepared, TAFE already. "A collaboration between Rheinmetall Defence Australia (RDA) and TAFE SA will result in Australia’s first Simulation and Training Diploma offered from 2018. The move is a welcome step as simulation and Live Virtual and Constructive (LVC) becomes a prominent feature in ADF training, particularly for 5th generation platforms already coming into service, with far too few skilled personnel in country to support the effort. The 12-month course is specifically designed to develop graduates with the high end graphics skills required to build defence-specific 3D virtual worlds. Rheinmetall’s Adelaide-based operations focus exclusively on electronic solutions for a range of customers including DST at Edinburgh and Army. ...In a plenary session on Plan Jericho and the role of Live Virtual and Constructive (LVC) training in a fifth generation Air Force at the Australian Simulation Congress 2017, Director Air Force Ranges Darren Manser raised concern that “a persistent pool of appropriately skilled personnel to support LVC training was also non-existent”. “I want a persistent workforce of people who can develop scenarios, manage accreditation, and take care of modelling and the security of facilities. That workforce does not exist in the scale needed both now and in the future.”..."
Ya got to luv that, our hornets are a “Calability Gap” filler. They will give them a gap. RAAF say they are operationally obsolete now, let alone in another 5-10 years. Former RAAF group captain Peter Layton warned yesterday that the RAAF could no longer extend the Classic Hornet’s life beyond its current retirement date of 2022 without the fighter becoming “operationally obsolescent’’. Does the RCAF agree? Or do they just not care anymore? It just seems like an absolutely horrible decision to be buying stuff that old now. At least Australia gets a little money for its old stuff. Eight Page PDF of this complete article attached. A former classic Hornet pilot, WGCDR Clare provides an interesting comparison between the old and new aircraft. “The F-35 actually flies very, very similarly to the Hornet, both classic and Super,” he related. “In fact, it’s probably more like the Super in the way it feels. The alpha (angle of attack performance) and the power is similar to a Super Hornet, although it’s got a little bit more power down low. “But the situational awareness is quite amazing, the way the information is presented and what the jet is seeing around you,” he added. “It’s to the point where, you can almost get information overload, so you’ve got to know what you’re looking for and know how to find it. You’ve got to know what the little tricks are that could throw you off. The pilots’ helmets are individually fitted. The pilot gets a laser map of their head made, and then the helmet is built around that map. “It takes a little while to get used to because it’s projected in front of both of your eyes, so it takes a couple of flights to actually make sure those are lined up properly and you’re not seeing double and giving yourself a headache.”..."
An OFF THE TOPIC item attached GIF showing the origin of the 'kangaroo in motion' OZ Roundel from same source above. Bet your bottom dollar or your sweet bippy I AM! spazsinbad wrote: 8) Bet your bottom dollar or your sweet bippy I AM!